Who does the box art? That is awesome. That's gorgeous! I may have to get one of those. How big is the model? That looks like a fairly large aircraft. 25cm length, (a bit less than 10 inches). Sweet - looks like a developed Fairey FD.2. Now that looks so cool , anyone know how much ? 34 Euros according to the site, which is pretty good! In fact its almost an "irregular" sharkit, a kit made especially for someone that at the end I have done some molds from. I have asked for one for my birthday next month. Is there an English translation of any of these classic comics your kits are from? They look rather interesting. but to find it now....hard. I also did a kit of the Espadon, a fiction plane design in 1946...amazing!! Following the promising trials of the Fairey VTO flying model at the Woomera test range in 1951, decision was taken to proceed with the construction of a full size machine. However at the instigation of the Ministry of Supply, Fairey Ltd modified the project into a conventional delta under the name F.D.1, this machine became known as the “Fairey Delta”. This design proved to be a flop. 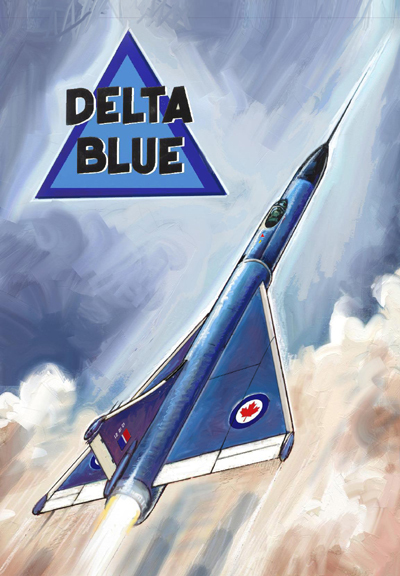 But it also turned out to be quite convenient for the British Military, as the original VTOL research had been continued in secret under the Ministry of Supply code name “Blue Triangle”. Project leadership was assigned to Pr Cooper, an expert in propulsion who developed a special fuel for ramjet engines. The machine was constructed in a government factory at Salisbury and transported to Australia in an unassembled form. Assembled on the Woomera test range it flew for the first time in 1954 piloted by Pr Cooper’s own son the Flight Lieutnant Daniel “Dan” Cooper. The first flight with a ramp-launched take-off and a vertical landing was highly successful with the speed of Mach1 being reached. Further flights proved that the combination of ramjets and rocket engines devised by Pr Cooper was highly successful, the Fairey “Blue Triangle” reaching an altitude of 129 000 feet (39300 m) and a speed of Mach3. Unfortunately the first prototype was later lost in a freak collision with a chase Hunter. The secret surrounding the “Blue Triangle” unfortunately leaked and the project became the origin of an espionage caper, a Japanese industrialist (possibly sponsored by his government) managing to steal some data pertaining to the project and to build a copy of the British experimental airplane. This “copycat” Triangle was however lost in a crash soon after its completion. On the other hand the development of the “Blue Triangle” was carried over by the British who managed to get a whole squadron of twelve “Blue Triangle” (the name stuck after the program became official) to do a fly-over at the 1956 Farnborough SBAC show. This series was later renamed “mk1F” when the “mk2F” entered service with the RAF that same year. The Blue Triangle was offered for export markets and not surprisingly the Japanese were the first interested and order a small batch (exact number undisclosed) of mk52 trainers (two-seaters). The Brazilian Air Force was the second customer with a dozen mk51 (= mk1F for export) and two mk52. Later the machine was evolved into further variants (mk3NF , mk4, mk5). The two-seater mk3NF became the main frontline fighter of the Royal Canadian Air Force following the debacle of the CF-105. Your model can depict either a mk1F (mk51)or a mk2F, the two variants being undistinguishable from the outside. Brazilian Air Force mk51 : overall medium blue, bare-metal control flaps, ramjet intake leading edge and tail fin leading edge. A thin metal band is visible behind the black nose cone. The cockpit nacelle ejection hatch is all unpainted. The wing leading edges are red. National insignias on upper and lower wings and fin flashes. Unfortunately the RAF serials are still unknown and no photograph has emerged of any of the Japanese legally acquired machines.